What is a Rosary you may wonder...and what is the meaning of the rosary beads? The meaning of the Rosary is simply a Catholic prayer based upon the Bible that focuses on the events in the life of Jesus and that of Mary the Mother of Jesus. In the Rosary prayer you make use of both vocal and mental prayer. Vocal prayer consists of the prayers listed below. Mental prayer is meditating upon the Rosary Mysteries which tell the life of Jesus and his mother Mary. The 3 basic prayers that make up the Rosary are: the Our Father prayer, the Hail Mary prayer and the Glory Be prayer. But since the Rosary consists of many other prayers it is usually prayed upon rosary beads so as to keep track of the prayers and free your mind to meditate upon the events in the lives of Jesus and Mary. What is the meaning of the rosary beads you may ask... the actual Roman Catholic Rosary is made up of a cross or crucifix, a medal, large beads and small beads. The basic Rosary diagram below is what a Rosary may look like although they come in all different types, shapes and sizes. You start by making the Sign of the Cross with the cross in your hand. Then you say the Apostles Creed while still holding the cross. Then you move your fingers to the large bead above the cross and say the Our Father Prayer. Next you move on to the three small beads upon which you say the Hail Mary Prayer. Then the Glory Be Prayer. Then you announce the Rosary Mystery being said. Then an Our Father Prayer. Then 10 Hail Mary Prayers. Then you repeat steps 7-10 until you have said a prayer on each bead contained on the string of rosary beads. Then you finish the rosary with The Hail Holy Queen Prayer, Breviary Prayer and The Saint Michael Prayer and finally the Sign of the Cross. 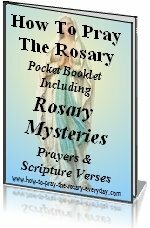 You also can print up any one of these handy Pocket Rosary Booklets, then learn how to fold them and keep them with you when you are just starting out praying the Rosary, plus they are handy to have when you become proficient at praying the Rosary for meditation purposes. They are so simple to make you can even print some up to hand out to people or children in CCD, etc. These Rosary print outs require Adobe to read it, so if you don't have it on your computer you can download it for free by visiting the Adobe.com website. I believe in God, the Father Almighty, Creator of Heaven and earth. And in Jesus Christ, His only Son, our Lord. Who was conceived by the power of the Holy Spirit, born of the Virgin Mary, suffered under Pontius Pilate, was crucified, died, and was buried. He descended into hell. The third day He rose again. He ascended into heaven and sits at the right hand of God, the Father Almighty. From thence He shall come to judge the living and the dead. I believe in the Holy Spirit, the Holy Catholic Church, the Communion of Saints, the forgiveness of sins, the resurrection of the body and life everlasting. Amen. Our Father, Who art in heaven; hallowed be Thy name; Thy kingdom come; Thy will be done on earth as it is in heaven. Give us this day our daily bread; and forgive us our trespasses as we forgive those who trespass against us, and lead us not into temptation; but deliver us from evil. Amen. Hail, Holy Queen, Mother of Mercy, our life, our sweetness and our hope, to thee do we cry, poor banished children of Eve; to thee do we send up our sighs, mourning and weeping in this vale of tears; turn, then most gracious Advocate, thine eyes of mercy towards us, and after this, our exile, show unto us the blessed fruit of thy womb Jesus. O clement, O loving, O sweet Virgin Mary! Pray for us, O holy Mother of God, that we may be made worthy of the promises of Christ. O my Jesus, forgive us our sins. Save us from the fires of hell, lead all souls to heaven especially those in most need of Thy mercy. Let us pray, O God, whose only begotten Son, by His life, death and Resurrection, has purchased for us the reward of eternal salvation. Grant we beseech Thee that while meditating upon these mysteries of the most Holy Rosary of the Blessed Virgin Mary, we may imitate what they contain and obtain what they promise through the same Christ our Lord. Amen. Saint Michael the Archangel, defend us in the day of battle. Be our safeguard against the wickedness and the snares of the devil. May God rebuke him we humbly pray and do thou O Prince of the Heavenly Host, by the power of God, cast into hell Satan and all the evil spirits who prowl throughout the world seeking the ruin of souls. Originally there were 15 mysteries of the Rosary. Pope John Paul II added the Luminous Mysteries or the Mysteries of Light in the year 2002 making a complete Rosary a total of 20 mysteries. These 20 mysteries are divided into four categories containing 5 mysteries each. An actual set of Rosary beads you may be familiar with [like the Rosary diagram above] is just one quarter of the Rosary Prayer. It's just that that is how much of the Rosary is usually prayed at one time. 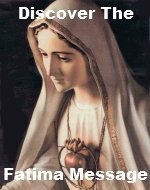 All 20 mysteries of the Rosary can be prayed in one sitting, however it is common to only pray one set of Rosary Mysteries. Within each set of Rosary Mysteries there are five decades of the Rosary. Explore the links below to follow the life of Jesus and Mary Mother of Jesus.